Folks, I’ve found my go-to brownie recipe. When I posted about making The Baked Brownie, it immediately became one of my most popular posts. 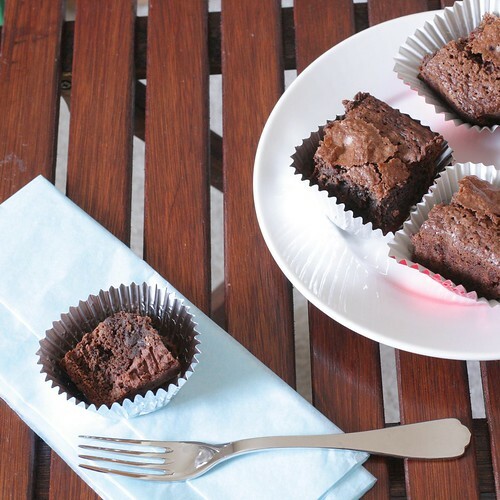 Clearly, many of us are brownie lovers, and many of us wanted to know why America’s Test Kitchen named that particular brownie the best in the U.S.
For me, this recipe kicks the Baked recipe to the curb. What’s so great about this particular recipe? Well, if you’re a baker, you likely have these ingredients on hand all of the time. Even if you’re not a baker, these ingredients tend to be pantry staples in many kitchens, so you can whip up a pan of brownies anytime you want. These brownies don’t dirty a lot of dishes. You don’t need special equipment. I prefer using parchment, but you can certainly just use cooking spray or butter to grease the pan. You don’t have to bother with melting chocolate. In short, these brownies aren’t fussy. Sure, I’ve added a little coffee and liqueur to intensify the flavor, but it’s not necessary. And they taste AMAZING. Rich. Chewy on the edges, fudgy in the middle, crisp on top. Brownie perfection. What’s your favorite kind of brownie/favorite recipe? Preheat oven to 350*F with rack in middle of oven. Spray an 8×8 or 9×9 inch metal baking pan with cooking spray, then line with criss-crossing sheets of parchment, spraying between the layers and on the top layer, leaving an overhang to make easy removal from pan. Melt butter in a medium saucepan. Remove from heat and stir in sugar with a spatula. Add eggs, vanilla, coffee, and liqueur, if using, and mix until blended. Stir in dry ingredients, slowly at first, then more quickly as the mixture blends, until batter is smooth. Spread batter in pan and bake 32-40 minutes (lower end of time scale for an 8×8 pan, upper end for a 9×9 pan), or until an inserted toothpick comes out with a few moist crumbs holding on. Cool completely on a wire rack. Cut into 16 squares. Store tightly wrapped at room temperature. Look and sound great. In the picture I see the top is missing – the tastiest bit? 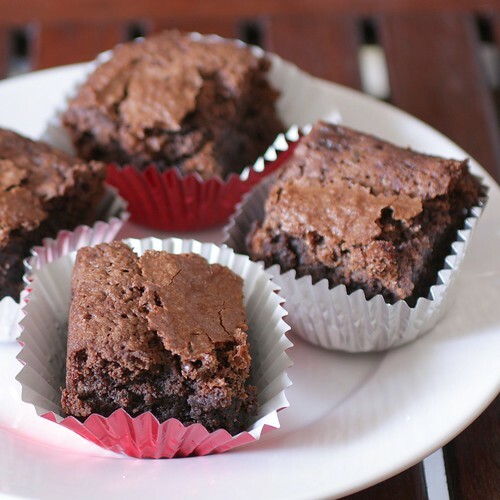 I don’t discriminate with these brownies – for me, all bites are equally good. Holy cow, these look awesome! delicious! Just tried them for the first time last night and I can honestly say this is a brownie worth making!! Super fudgy and thick! I’m glad you liked them as much as I did. Hello- Just a quick question. Is the coffee made like a cup of coffee or do you use the grounds? Thanks!!! Prepared coffee – I just use leftovers from the morning pot of coffee. I made these yesterday, and I gotta say they are the best brownies ever. My family thinks so too. PS–I used a silicone pan and they came out perfectly. Donna, thanks for letting me know about the silicone pan – I’ll definitely use mine next time. These are by far the best brownies that I have ever made! I omitted the liqueur and coffee(I am 13), and added a tablespoon of water, and they turned out perfect! 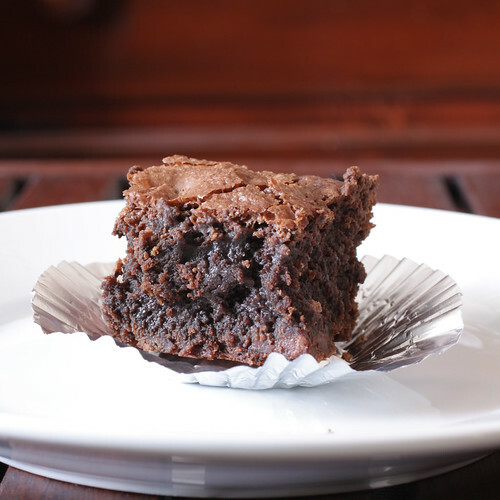 So fudgy and moist without being underbaked or stringy. Thank you so much! Oh my! I’m in food heaven! I used Callebaut 100% Cocoa Powder (Extra Dark) which made the taste incredible and added some semi-sweet chocolate chips to the batter because I’m a chocolate nut! The crust was crispy after cooling and the centre was just the perfect fudginess and moist. Definitely a keeper! Thanks! Corrections it was Cocoa Barry 100% Cocoa Powder (Extra Dark). My bad, I was under the influence of too much chocolately, fudgy goodness! Can I substitute oil instead of butter? Is the recipe typed correctly? Is it really only 2/3 cup flour for 2 cups of sugar? I’ve made these quite a few times and they are my go to when contributing a dish at parties. Everyone loves them and the texture is just perfect!